I've had so much fun using Twitter these last few months. 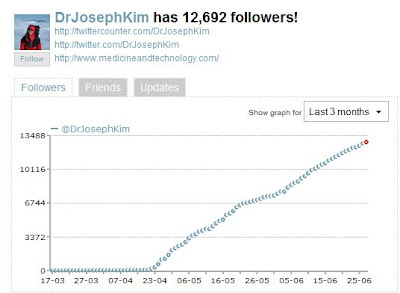 I began seriously using Twitter in mid-April and look at my growth chart over the past 3 months! Twitter has helped my blogs and my blogs have helped my Twitter account. As I near 13,000 followers, I often think about the long-term future of Twitter. Some are speculating that Twitter may be a fad that's going to pass fairly quickly. I must disagree. I see that more professional medical groups and corporations are starting to use Twitter to boost their online visibility. Twitter is probably the easiest and fastest way for you to boost your online visibility. So, if you have something you'd like to share with the rest of the world, make sure you're leveraging the social networking power of Twitter. Want to boost traffic to your blog? Use Twitter! I am certainly using twitter to develop my Internet platform. Just have to resist the temptation to read all the tweets of everyone I am following.